As we found before with Australasia, the artwork doesn't tell you so much about what to expect. It's like a blank cover to a two-thousand-page epic masterpiece of literature. When we first came across this guy in his release Sin4tr4, there was a nice horsie on the cover, so we sadly ignored listening to it for weeks upon weeks, expecting a submission from someone who never even peepsed our site to see what we cover. Probably some sort of folk thing, some horse-riding gobblety gook acoustics you'd scarcely notice in a coffee shop if you were sitting under the speaker. Ooops. Seriously, though, who would think "post-black metal shoegaze" when they look at that horse? Really now. A jackdaw, getting closer, but Australasia still doesn't like to lead you on in any way, he leaves that up to the music. Was totally psyched when this one came in, the new address is up, promos keep coming, and to set off the first week this one came in to our happiness and enjoyment, even though we got to it like three months later. Vertebra is a much longer, more full experience of this man's musical abilities. It includes two songs from the previous release, Sin4tr4, but the rest of it is entirely new, and entirely awesome. We went into this will full expectations. We expected everything out of it and more, and we got even more than that. The current Bandcamp selection you'll find above only includes four songs out of the ten present on the album, so don't be fooled. This isn't an EP, it's a full-length. But in terms of direction it's largely the same thing, and for once you don't run screaming from that statement in terror. Vetebra builds on the post-rock/post-black metal foundations of Sin4tr4, and in fact you can consider this to be in many ways an extension of what he was doing prior. Australasia's sound is of the dreamy quality, the kind that makes a memory out of the mundane. His usage of spacious effects is artistic, completely lacking in the tap-dancing pedal-pounding foolery you see from lots of these Indie and post-rock acts of late. We've said it countless times. If you see a board full of pedals up there, they don't know how to use any of them. 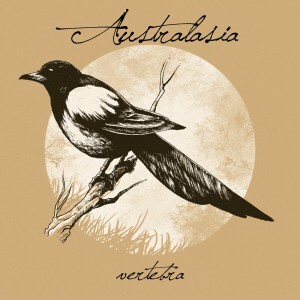 Not so here, Australasia has an incredible way of creating space and substance using repetitive chord work and just the right touches of beast via effects. When he leans towards black metal, it moves into expansive structures with vibrant flows. In addition, for those of you who missed it the first time around, this is almost entirely instrumental. There are only some occasional touches of singing, but they're largely used for more atmosphere, like another instrument instead of deriving focus from lyrics. It's more about their delivery than their content. When that girl gives it her all, yeah, wow. The opening track, "Aorta," will give you a hefty does of this right at the end for you to pine over. But it comes with more than that, it comes with piano, it comes with simplistic, analog-sounding electronics. There are tons of details to be found in Verterbra, more than the usual post-insert genre approach, and it takes off basically where Sin4tr4 ended. That's risky in itself, but risk well taken in this case. There is a bit more electronic dominance in this release, but just enough, it never overpowers. He leans towards the minimalist approach, light touches of that Moog type sound, and it creates just enough background to further intensify the rest of the music, and occasionally it's brought to the forefront to make it distinct. Typically, a band like this requires vocals, but here it's not even needed because of the amount of variety and style he pulls out of it, which works surprisingly well. Removing lyrics can be one of the most difficult approaches in this type of music, as many bands are completely incapable of creating substance through their sound alone and minus vocals to pick up the slack, it's a disaster. Getting that kind of sound from being able to work the instrumental angle enough so the listener is completely engaged is an accomplishment, one which Australasia has done again. Listening to this is in many ways a journey, it can turn almost any scenario into an emotional ride. Dig up some old memories, create some new ones, bring it all together.